With less than a week before the opening of what is unquestionably the greatest motorcycle racing event in history, some of the defending champions my be in for a long fortnight. The annual precursor that takes place in the north of Ireland, known as the NW200, certainly brings cause to question what challenges await at the Isle of Man TT. One defending champion in particular, 13 time TT winner John McGuinness, was all but shut out on the emerald island this weekend with only two third place podium finishes in the 250cc and Superbike race 1, the first two races of the day. From there it was all downhill for the successor to 9 time TT champion David Jefferies, whose potential to contest the overall wins lead was cut short due to an unfortunate accident in a thursday practice session that took his life in 2003. As it is in all of motorsport, it’s not the first time someones racing career has been tragically interrupted. One family known for many years to the followers of real road racing is that of the undisputed ‘King of the Roads‘ Joey Dunlop, and his younger brother Robert who sadly passed away after a crash in practice at this years NW200. In the opening contest of this years NW200, Robert’s son Michael rode to his first North West win on his Pirate Racing 250cc Honda. Veteran rider and relative newcomer to the TT, Steve Plater, could turn out to play the foil to John McGuinness, if his performance at this years NW200 is any indication, as he captured the top spot on the podium in both Supersport 600 races and the second Superbike tilt. TAS Suzuki riders Bruce Anstey and Cameron Donald could also play into the mix this year in both Supersport and Superbike. 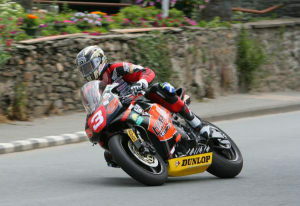 Although up until last years Centenary event, one could freely listen to the RadioTT stream from Manx Radio online. That is no longer provided free, instead the official IOMTT site is offering an affordable pair of packages on their TTLive page for £10 and £20, with a discounted ‘Gold’ package price of £15 if subscribed before Tuesday, May 27th. ITV4 is said to be providing some coverage of the races also, that should be available online. So, as the clock counts down to the opening ceremonies for the second century of racing on the mountain, it could turn out to be one of the most contested events of the last decade and looks primed for some potential upsets to be had. Best of luck to all the riders for a safe TT this year. I can predict the winner of the presidential election even now: the government. In a one-party system, that’s how things work. One-party system? Yes. The American political scene makes much more sense if you think of the two parties as two divisions of the same party. Admittedly that is hard to do at first. All American politics is presented as a tooth-and-claw rivalry between Republicans and Democrats. It is certainly true that elections determine who holds office among the parties’ candidates, and who holds office determines whose cronies get sinecures and contracts. That does give the appearance of real competition. Moreover, the major news media are willing participants in the charade that Republicans and Democrats have substantially different ideas about things. Generally, we are asked to believe that Republicans want less government and more war, while the Democrats want more government and less war. As you may have noticed, that makes no sense. War and government go hand in hand, and both parties want more government. Each side tends to dislike only the wars started by the other side. Read Sheldon Richman’s complete article at the Future of Freedom Foundation.